I've begun working on a mystery graphic novel set in Buenos Aires, where I recently spent four months doing, among other things, some travel writing. Since my protagonist is a travel writer & sports blogger, this excerpt seemed especially apt. February 7, 2011. It wasn’t easy finding a sports bar in Buenos Aires that would be broadcasting the Big Game. Mention “Super Bowl” to most porteños, as the denizens of Buenos Aires call themselves, and you’re likely to elicit a blank stare or a yawn (accompanied by that most Latin of gestures, the dismissive air-swat). The biggest excitement I encountered was amazement that a thirty-second commercial could actually cost $3 million (dollars no less, not pesos) – ¡puta de dios! 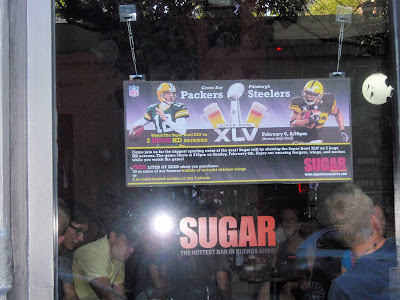 However, I did locate a venue, a club called Sugar, in a very lively, bustling area called Palermo Soho. Sugar, run by an American if his accent could be believed, was deep, dark, excessively noisy and I would venture to guess that nearly every norteamericano in BA, in particular those younger than 30, was there. I had taken a willing but utterly baffled new amiga with me, and we ended up sitting at a table with two American women from San Francisco, Lydia and Clara. Clara had just finished a three-month apprenticeship with a protégé of Buenos Aires’s (perhaps) most famous chef, Francis Mallmann, whose cookbook Seven Fires is considered by many to be one of the best guides to all things grilled. Lydia, her friend, had come to visit for the final two weeks of Clara’s stay. The game was broadcast on two large screens, one at the very back of the very narrow back room, and one near the entrance. Diana and I had arrived early in order to get a seat and perhaps (at least in my mind – Diana never did have a clue about what was going on) watch some of the pre-game show. Our screen, which rippled gaily in the breeze from the open front door, was partially blocked by a large brick column and a group of boisterous young Americans who continually jumped up and over the backrest of the booth in front of us to get mas y mas cervesas. We could barely see what was going on. The possibility of hearing anything in the din was non-existent, and, in any case, the commentary was in Spanish. Instead of the usual pre-game sampling of interviews, musical performances, and prognostications, what seemed primarily on offer were clips from recent soccer matches featuring the team Boca Juniors. (A friend here, a native porteño, a cultured, erudite man, in utter seriousness informed me that one particular game between Boca Juniors and their deadly rival River Plate was simply the most important game ever played in the history of sport. In the history of sport! The most important!) The commercials were all Argentinian – none of the most expensive ads in the world made it this far down. Sugar is renowned, at least in the ex-pat community, for its reasonably authentic buffalo wings and when ours finally arrived (the handful of waiters were run off their feet so our food showed up during the half-time show) we were able to confirm that we might easily be in any American city if cuisine were the only distinguisher (well, maybe not Pittsburgh since the majority of Sugar’s patrons were cheering for Green Bay). The most prominent brand of cervesa was Stella Artois. Everyone spoke the universal language of burgers and French fries. But clearly we were not in Kansas any more. I’ve been reading Pico Iyer’s remarkable book The Global Soul in which he examines exiles and immigrants, fractured identity, the transformation of cities, the rise of a new tribalism, and the eternal, human search for home. (The book, which is deeply optimistic about the ultimate value of multiculturalism, was published in 2000 – it’s hard not to wonder how differently he might have viewed his subject if through the lens of 9/11 and its aftermath.) In the barrio surrounding Sugar there were far more people outside than in: enjoying their cafes con leche, their conversations (on and off cellphones, occasionally both together), their early dinners (or late lunches since dinner in BA usually beging around 10:30), oblivious to something designated “super” unfolding nearby. English was discernable in the ambient roar of the club but the prevailing rhythm was Castellano. When one is a traveler in a foreign land and not just a tourist (as defined by the degree of time and solitude), one begins to understand what ‘home’ is and what it’s not – at least a little. I have ‘home’ in the form of my bank account (which, god willing, is sufficient to see me through my visit), my facility with the world’s most dominant language, the Internet and Skype so family and friends can be present at least in some electronic form, the airline ticket that in three months will return me to my familiar life. I’m lucky to have made a few friends here and I’m learning enough Spanish to get by and even, sometimes, communicate. The local economy is benefiting from my presence and I’m enjoying pleasant encounters with shopkeepers and the women in my dance class. I’m not an exile or a refugee or even someone seeking a better life in a place far away (and willing not just to pay but also to abandon whatever I must to get there). My being here for an extended stay isn’t tinged with loss, except for the temporary deprivation of the comfort of understanding the unspoken rules, of having a place within the community. You might even say that on some basic level, I’m experiencing what it’s like to be a stranger in a strange land. Perhaps, as the heated, often vicious and simplistic, debate about immigration policy rages on in the United States, we need to remember that most immigrants bring something to give, and not just come for what they can take. As Iyer notes, immigrants hold our dream of the promise of America and in believing, they help realize it. Maybe we need to examine the view through their eyes. We need to know what it’s like to be on the far side of the glass. That’s one reason I’m here – to engage in that conscious act. At Sugar, I was watching the Super Bowl but in fact I was, like so many people in so many alien places, on the outside looking in.